What's the difference between customer satisfaction and customer loyalty? Everything. Michael Hinshaw talks to Community Banker editor Debra Cope. How do financial services marketers improve marketing and brand performance, relevance, value and accountability? That’s the question branding and marketing consultant Michael Hinshaw says community bankers need to ask themselves. His firm, McorpCX of San Rafael, Calif., cites studies that show 60 percent to 80 percent of lost customers have described themselves as “satisfied” or “very satisfied” in customer satisfaction surveys just prior to defecting. Hinshaw recently spoke with Community Banker editor Debra Cope about how banks can stave off net account loss by converting satisfied customers into loyal customers. CB: How much does it cost to find new customers, versus retaining existing ones? It costs five to six times more to attract a new customer than to retain an existing one. The average cost of acquiring a new customer is around $325, and payback takes about three years at average attrition rates. Clearly, the longer you keep a customer, and the more products you’re able to sell to that customer, the more profitable they’ll be. In my experience, banks don’t have nearly as good a grip on the costs of customer acquisition as they should. Bankers are expert at analyzing financial data, but looking at customers has typically been a marketing function. While bank marketing has typically been less numbers-driven, this needs to change for marketers to become more relevant to their organization, and for bankers to better understand the importance of marketing data. CB: How useful are customer satisfaction surveys in predicting whether customers will stay or go? They’re not. Just 30 percent of customers will consider their bank for future credit or deposit product purchases, in spite of average satisfaction ratings in the 80 percent to 90 percent range. Time and again, 60 percent to 80 percent of lost customers have claimed to be “satisfied” or “very satisfied” in satisfaction surveys just prior to defecting. The fact is, about half of those customers who leave banks leave for reasons over which the bank has no control and no influence—marriage or a move, for example. But the other half leave for reasons to do with the bank. The reasons include poor service, perceived high fees, and lack of communications. CB: What’s the distinction between a satisfied customer and a loyal customer? A customer who claims to be satisfied is emotionally neutral. Loyal customers, on the other hand, have less price sensitivity, stay longer, and are significantly more active users of bank services. They tell their family, friends, and business associates about the bank. Loyal customers will transact more over time, and devote an increasingly larger share of wallet to the bank relationship. They are more likely to forgive the occasional hiccup. The tendency of loyal customers, or advocates, to drive new business to the bank is exceedingly valuable. CB: How do you help banks build customer loyalty? We’ve developed a research methodology called Loyalty Mapping that measures several factors, including customer loyalty, the bank’s performance on the drivers of satisfaction, and how important these drivers are to different customer segments. We utilize the results to help banks improve service, build stronger relationships, and increase loyalty. Loyalty is a step along the continuum in a bank customer relationship. 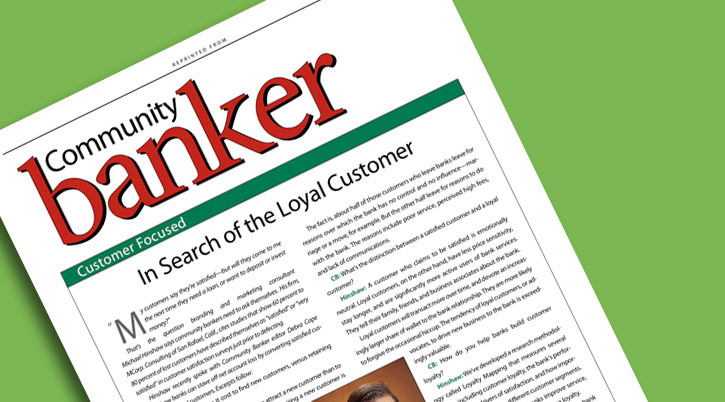 The question for bankers is how to move satisfied customers to become loyal customers. To do that, you really need to understand the drivers of satisfaction. We’ve conducted research similar to this for years with large banks, Loyalty Mapping was developed for smaller banks. It takes the custom research we’ve done and packages it in a turnkey way so that community banks can conduct ongoing benchmark research on an ongoing basis, and track the results online. If you’d like to speak with someone at McorpCX, please reach out!